Cooked pasta in a tomato dressing with roasted red peppers, onion and spinach, topped with feta full fat soft cheese and marinated semi dried tomatoes. Crumbly Greek Feta. Our chefs have developed recipes using carefully selected ingredients to create vibrant salads which are full of flavour. 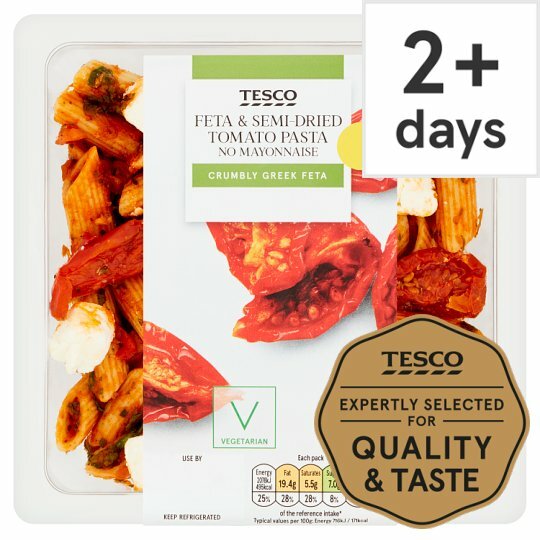 INGREDIENTS: Cooked Pasta [Water, Durum Wheat Semolina], Feta Full Fat Soft Cheese (Milk) (10%), Onion, Tomato Paste, Marinated Semi Dried Tomato (4%) [Tomato, Sunflower Oil, Salt, Garlic, Oregano], Rapeseed Oil, Roasted Red Peppers, Tomato, White Wine Vinegar, Spirit Vinegar, Spinach, Sundried Tomatoes, Basil, Parsley, Sunflower Oil, Cornflour, Salt, Garlic Purée, Concentrated Lemon Juice, Pepper, Garlic, Rosemary.